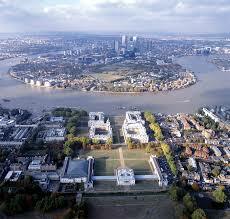 Greenwich has quite a history, a right royal history in fact, thus the Royal Greenwich name. In fact Greenwich is a strange name in itself, which came courtesy of the Danish settlers, meaning Green place by the mouth of a river. Quite a sensible name, really. Of course, Greenwich is probably best known Greenwich Mean Time. This is pretty much where time starts (and ends, if you think about it). Greenwich is also home to extremely fine architecture, a testament to its regal history. It may well have been the case that, in these regal buildings, the occasional hog roast would have taken place. Maybe Royal Greenwich should also be hog roast Greenwich. Hog roast Greenwich events in years and centuries gone by would have been very important events. Hog roast was a special feast and certainly something for the diners to look forward to. These would have been lavish events with no expense spared. Hog roast really was something quite special. So why did hog roast fade away into the background when it came to special event food? Perhaps hog roast was seen as an ‘old’ food that modern diners would not enjoy? Maybe it was considered impractical, cumbersome and expensive? This is all a great shame and has meant that many a diner has missed out on the stunning flavour that you get from a hog roast. Times have changed through and twenty first century diners are beginning to reassess hog roast. Hog roast Greenwich events are now more commonplace… and it is not hard to understand why. 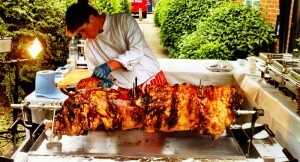 Hog roast is the most perfect corporate event catering solution there is. 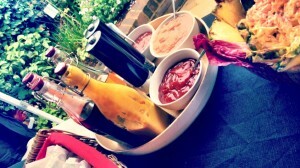 Corporate event food is all about making a big impression. You want to make a statement about you and your company that is positive, dynamic and unique, so you certainly do not want to serve your guests a dreary, nondescript meal that they could have had a thousand times before. Hog roast is anything but. Hog roast is an exciting meal from start to finish and one that your guests will remember for a long time. It all starts from the minute your guests enter the venue, for they will be greeted by the most amazing aromas coming from the slow roasting whole pig. And then of course, there are the visuals of hog roast. Hog roast looks the business: a whole pig on the imposing Greenwich hog roast caterers roasting machine really is a magnificent site. When your guests see this they will immediately know that you have made a concerted effort to impress and delight all your guests. It’s things like this that make a real difference in business! The meat itself is presented with all the professionalism and style of a top restaurant meal, so don’t worry that you’ll be getting pork on a roll. This is a business event, not a family garden party. And as for the taste, well, you will know that hog roast tastes incredible before you have taken a single bite. So go on, make the effort to ensure your Greenwich event is a right royal hog roast occasion.